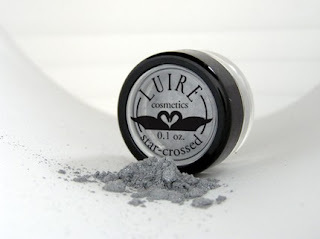 Another great thing about Luire is that they offer a discount when you buy two or more eye shadows. Kate is the owner and creator of Luire and answered a few of my questions about herself and Luire. Well, let’s see. My name is Kate, I’m 22 years old, and I’m just finishing up degrees in graphic design and fiber arts at Truman State University in northern Missouri. I live in a shoebox-sized apartment with my boyfriend of 7 years, and every square inch of it is crammed with sewing supplies, books, video game equipment, crochet hooks, bits of yarn, cupcake wrappers, half-finished articles of clothing, and color swatches. 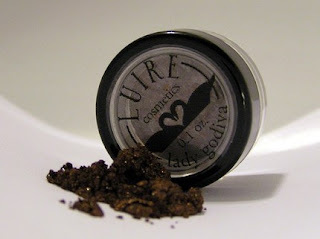 Please tell me more about Luire makeup. This one goes out to all you creatures of the night–or those of you hoping for a nibble. Four romantic, dramatic eyeshadows, perfect for a night in an underground club or a cloudy day–Scarlet Letter, Forever, Star-Crossed, and Vampire Lover–in 5-gram jars, plus a full tube of our brand-new Original Sin lip gloss, all packaged in a pretty handmade black-and-red satin bag. Perfect for gift-giving–or gift-keeping. Includes a bonus pair of mini tweezers for picture-perfect brows. Over a $40 value for $25! One word here- WOW! I love love love that its Twilight inspired and made me imagine as I was putting on the makeup that I was on my way to meet Edward Cullen (sigh). Corny I know but a girl can dream right? There were 4 different eye shadows that came with this kit and they were all really gorgeous. My favourite one was the Star Crossed eyeshadow which is a pale, sparkly silver colour. I loved the glitter of this shadow and it was easy to apply and stayed on nicely. I also liked how all the eyeshadows were really easy to blend in with other colours to create a layered effect on my eye. The colours all made my eyes pop and were long lasting. I liked the versatility of the eyeshadow- that I could wear just one and have it look great or put all four on my eye to create a dramatic effect. The lip gloss “Original Sin” was really pretty too. It looks like it would be a dark red in the tube, but its actually a much softer red and not at all overpowering which is definitely a big plus. It’s not sticky or bad tasting like other lip glosses that I have used. It goes on nicely and gives my lips a bit of colour and moisturizes at the same time! The Kit was packaged so pretty in a gorgeous black and red satin bag. It would make a perfect gift or even something nice to buy yourself. It’s a really awesome price too- only $25 and look at all you get inside. You can’t find that kind of deal at the make up counter for this quality of product. The natural ingredients were really impressive. I prefer products that don’t contain preservatives or synthetic fillers because my skin is quite sensitive. These products didn’t bother my skin at all. 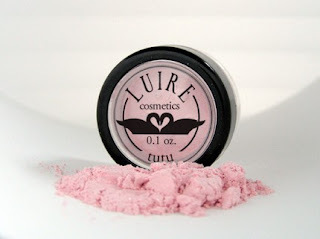 I love Luire- great quality, natural ingredients, original colours and awesome prices! Luire would like to offer my readers a 20% discount on their order. Please input the code SVBLOG in Notes to Seller to receive the discount.